Thrill Hopper E-tickets are valid 1st February to 30th November 2019. The Thrill Hopper E-Ticket is valid from 1st February to 30th November 2019, excluding Bank Holiday weekends, special events e.g. Fireworks and concerts and attraction closed dates and provides one entry to each of the four participating venues. 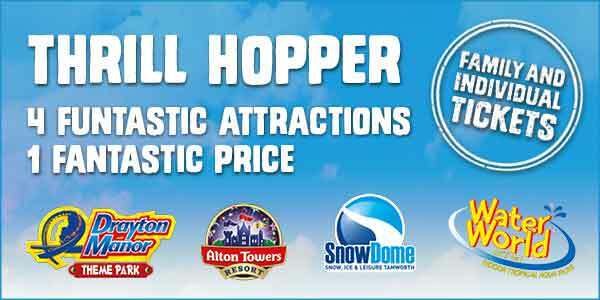 Alton Towers Resort main season is 23rd March to 1st November 2019. You must print-off a paper copy of each part of your E-Ticket (4 pages per e-ticket). This must be presented and surrendered at the relevant attraction. The Thrill Hopper E-Ticket is valid for one visit per person to each of the four participating venues excluding Bank Holiday weekends, special events and attraction closed dates. Pre-booking is essential on 0344 800 0011. Thrill Hopper e-ticket qualifies for Ice Skating (all ages), Snowplay (2+ yrs), Tobogganing (5+ yrs), Junior Tubing (7-12 yrs) or Adrenaline Tubing (12+ yrs). Children under 10 years old must be accompanied by an adult. The Thrill Hopper E-Ticket is available to all ages. Family tickets are valid for 2 adults and 2 children under the age of 12. Please note that size, height, weight and age restrictions and medical warnings may apply on some rides. Children under 12 must be accompanied by a responsible adult (18+ yrs) at all venues. Thrill Hopper cannot be used in conjunction with any other promotion or offer. All rides, activities and attractions are subject to availability. The attractions reserve the right to refuse admission. Additional proof of ID may be required. No refunds given on Thrill Hopper E-Tickets under any circumstances. If this is a personal purchase and you are a UK taxpayer*, Staffordshire County Council (NVG) can increase the value of your purchase without costing you a penny. If you tick the 'Reclaim Gift Aid' box and fill in your full name and home address details, Staffordshire County Council (NVG) will be able to claim at least 25% extra from the Government on top of your purchase made through Staffordsheer Escapes. Your name and address will be forwarded to Staffordshire County Council (NVG) in this case to allow them to claim the Gift Aid. *You must have paid UK tax this year at least equal to the 25% Staffordshire County Council (NVG) will claim.